This is one of the bestselling cluster fly treatment packs available on the amateur market, designed for the eradication of cluster flies in lofts, roof spaces and living areas. The combination of products delivers rapid knockdown and provides long-lasting cluster fly control for up to 12 weeks. This Cluster Fly Treatment Pack has been carefully put together by our pest control experts to offer you the best combination of cluster fly killing products and enable you to eradicate a cluster fly infestation in your home or business. Each kit contains sufficient products to carry out several treatments to a standard roof space. This pack contains our best selection of products, including Pest Expert Formula ‘P’ Foggers, which unlike traditional smoke bombs do not require a naked flame, making them completely safe for use within an enclosed space containing flammable items of with visible insulation. 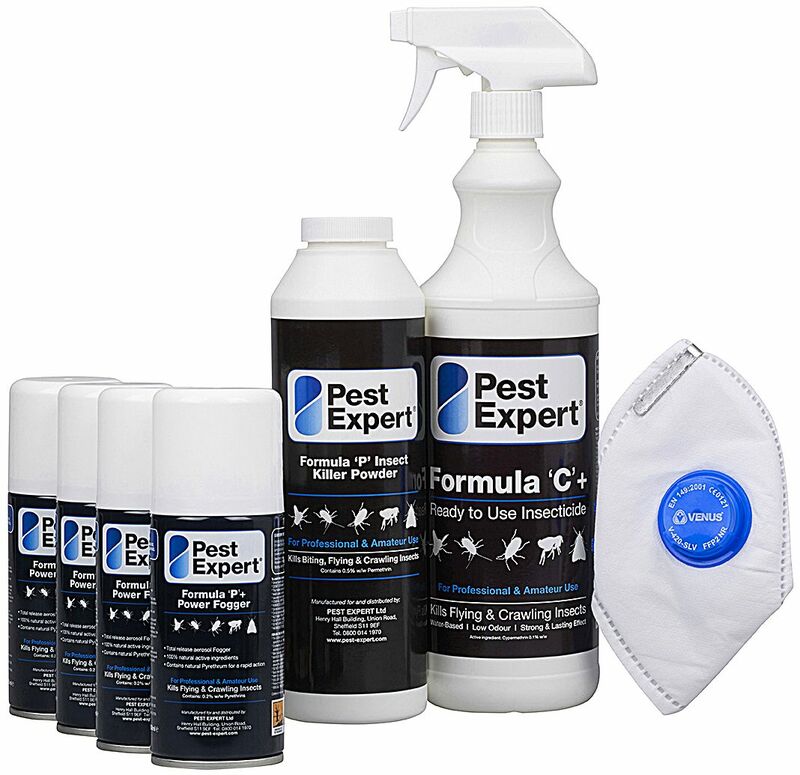 This kit also includes the hard-hitting residual insecticides Formula ‘C’ Cluster Fly Spray and Formula ‘P’ Cluster Fly Powder from Pest Expert, offering ongoing killing power for up to 12 weeks following the initial cluster fly treatment. 4 x Pest Expert Formula 'P' Fogger: An aerosol ULV canister which is activated by a trigger to release a gas saturated with the natural insecticide pyrethrum. This powerful fumigation device is ideal for flushing out cluster flies from lofts, roof spaces and other areas of your home or business. Once activated it will fill up the volume of the enclosed room killing all cluster flies present at the time of use. As it requires no naked flame and leaves no residue, Foggers are a safe, clean and efficient method of cluster fly control. They will not trigger smoke alarms, pose no fire hazard and will not cause any damage to interior furnishings, making them an exceptional choice of fumigator. One fogger should be applied at a rate of one per 150 cubic metres, roughly equating to a standard loft space. 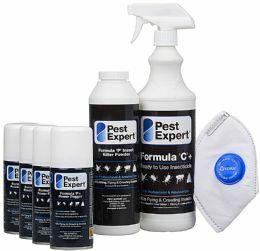 1 x 1 litre Pest Expert Formula 'C' Cluster Fly Killer Spray: A highly-effective cypermethrin-based insecticide with residual value for both fast-acting and long-lasting cluster fly control for up to 12 weeks after initial application, offering extended protection from cluster flies. For direct application to alighting surfaces, including roof beams and window frames. Formula ‘C’ is non-staining, solvent free, low-odour and completely invisible mang perfectly suitable for use in homes with children and/or pets. A 1ltr triggers spray will cover an area of approx. 20 sq m.
1 x Pest Expert Formula 'P' Cluster Fly Powder 300g: A fast-acting contact dust and residual insecticide with the potent synthetic pyrethroid, permethrin. Idea for application to alighting surfaces and any obvious entry points, particularly useful around power points where a water based spray would not be suitable. The convenient puffer pack makes it easy-to-use and contains twice the amount of powder to comparative products. Each kit is also supplied with a detailed Instructions For Use sheet on how to use the individual products to carry out a straightforward and effective cluster fly treatment. Pest Expert Formula ‘P’ Cluster Fly Powder is a powerful permethrin contact dust with a long-lasting residual effect. As well as killing upon contact, when applied to potential entry points the powder will continue to provide ongoing protection against re-infestation. Ideal for use in areas unsuitable for a water based spray. The convenient puffer pack ensures and easy and quick application.